Publisher: Recorded BooksCharlie Gordon knows that he isn’t very bright. At 32, he mops floors in a bakery and earns just enough to get by. Three evenings a week, he studies at a center for mentally challenged adults. But all of this is about to change for Charlie. As part of a daring experiment, doctors are going to perform surgery on Charlie’s brain. They hope the operation and special medication will increase his intelligence, just as it has for the laboratory mouse, Algernon. Meanwhile, each day Charlie keeps a diary of what is happening to him. This is his poignant record of the startling changes in his mind and his life. This book was required reading when I was in Jr. High. I really liked the book and never forgot about reading it so I decided to read it again, but this time I wanted to listen to the audio version. I loved this book in school, and I loved it as I read it again. I felt for Charly. He was a kind soul who laughed along with everyone when they laughed at him, because he didn’t know they were laughing AT him. He didn’t have the best home life either. Things started to drastically change once the experiment started and Charlie was able to read, write, and learn the way he had always wanted to. I loved that he finally knew what it was like to be “normal”, and even a genius. I felt many emotions while listening to this book. Parts made me happy, some made me cheer for Charlie, and some made me sad. 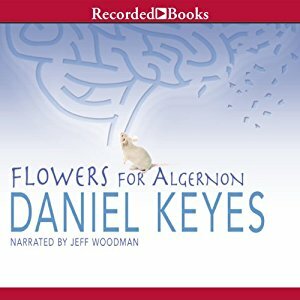 It’s funny that the parts I remembered were of Algernon and Charlie, and had forgotten the relationships he had with the two women in his life. I’m a little shocked that this was assigned to us in Jr. High. I’m wondering if it was a “cleaned up” version. No, it wasn’t R rated, but for 12 year old kids back in the ’70’s, it was a bit risque. The book is narrated by Jeff Woodman, and he did a great job. His voice made it easy to listen to. This book was a great read, and listen, and I’m so glad I revisited it. I also remember reading this in high school and I loved it. Good to know it held up over time. Did you remember his relationships with Faye and Alice? I enjoyed reading this a few years ago. It sounds as if the audio book would be wonderful to listen to as well. I really liked the audio version. I never read this one in school. Or at least I don’t remember reading it. It sounds good. I’m glad you like it on audio. I think if you had read it you would remember it. It’s just that kind of book. I enjoyed this way back when, too, and have it on my list to reread. Glad to hear you loved the audio version. I’ll check it out! I hope you do read or listen to it again. I’d like to know your thoughts. I can’t wait to see your review!